Hi , new to the forum so go easy on me pls . Anyway does anyone have experience using the 80cm perforated sky dish in france , I cannot see a reason why it shouldn't work but I would like some help . First, assuming you are seeking UK targeted TV. Then a qualified "yes" IMO an 80 CM dish should work throughout France, even with the slightly reduced gain from a perforated one. The qualification comes with weather, if there are deep clouds you will get break up and total failure whilst these pass, basically the further you are from Leicester the greater the challenges. So abutting Italy on the Med you could fail. It will depend on how far south you are going. I have a 60 cm dish and this worked fine for me in the Dordogne. If you search Satgear on here they will probably give you a more definitive answer. Many thanks for the replies , we're just south of Poitiers , wanting to use this dish as I can get everything in the UK , including a quad lnb . Interests:AFC Bournemouth. 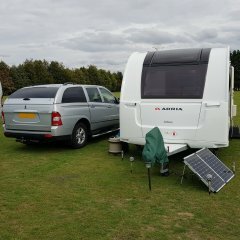 Cricket and Caravanning. 80 size will work fine in the Poitiers area. Your 80cm dish should present no problem until you get a lot further south. What can present a problem however, (as many D.I.Y. ers before you have found out the hard way) is aiming the dish accurately enough (to within 1° ) to pick up the correct satellite signal. I've got a satfinder thing , plus I thought the sky dish installed at 90 degrees gives the correct elevation . but could be wrong . Well at least you have a Satfinder so that’s a start. 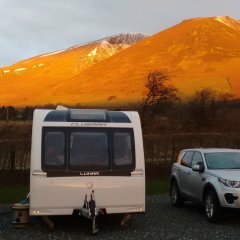 I strongly recommend now that you Google an article “wot I wrote” a few years ago for another forum which should give you an insight into just what is involved in setting up and accurately aiming a satellite dish at the correct satellite, (which is actually about 24000 miles up in the sky and not where you might imagine your dish seems to be pointing! ! ! Google – “The art of aiming a satellite dish”. Read through the info and come back to me with any questions that you might have. Remember that I wrote it some years ago and some links may no longer be available. We never ever did master the art of satellite alignment. Gave up and settled for reading a book. Whilst your 90 degrees might work for your dish where you live remember at Pointers you are nearer the satellite so have to be "looking" up at a higher angle. IMO you need a dish or means to know the elevation angle your dish is pointing, eg a good scale, protractor or clip on clinometer. This IMO is the most challenging element in aiming a dish. Some dishes intended for fixed installations have very poor elevation markings and means of adjusting. Triax folding arm dishes have some of the best elevation setting features, a big arc like sliding "shoe". Then use this site to determine the setting you need,. At Pointers the elevation is 30 degrees. You need to enter the place you are at and the satellite we need, that is the 28.2E Astra cluster. Now's your chance to have another go! Don't wait till you're travelling, practice at at home till you get the hang of it. Using my two "Gismo's" I eventually got the set-up time to a few minutes without even having to switch on the TV! Have you got a link for your articles ? you may have a better idea than us . Thanks, but sold it now. Put it down to experience, thought it was a good idea at the time but it was not to be. There are many articles on the internet on how to set up a mobile system including the ones by Vin Blanc. Having been doing it myself for about 25 years the advice I would give is read them and practice a few times at home. As Vin Blanc has said the Satellite is a long way away and in the digital world if you don't get everything right it will not work and you will get frustrated. Even little things like getting the pole 100% Vertical is vital. As suggested look up on Dishpointer the exact information you need by keying in your destination and the Astra satellite required. Do your homework and you will be ok. Rush it and you have very little chance of being successful. Actually, getting the pole 100% vertical is not vital at all, unless you're using a motorised dish that needs to track the arc of the horizon as it moves from satellite to satellite (extremely unlikely in a caravan). I've used mine on sloping (not too severely) ground lots of times, and it just takes a minor tweak to the elevation of the dish to compensate for the tilt of the pole to line up with the satellite. A question for Vin Blanc. On this Australian Link it shows the gadget you suggest in the middle of the dish. What do you think of this? Yes but much easier to get the pole correct in the first place. As suggested look up on Dishpointer the exact information you need by keying in your destination and the Astra satellite required. Is it not easier to use an app that takes into account of your location? Possibly but I am in the habit of getting the info from dishpointer then just set up the dish knowing that it is correct. Just personal preference I suppose. I have nothing to do with Satgear, but I have the same LNB & receiver (not the same dish) as in the image. As long as the dish has line of site (no trees or buildings in the way). Its the easiest satellite system to set up. (I used to do it the hard way). As the season is about to start, keep an eye on Lidl & Aldi as they regularly have them no sale? It might be worth mentioning that if you have an Avtex TV, that comes with a built in Easy Find decoder. So purchasing the matching Easy Find enabled LNB is all you need to bring that quite useful feature to your setup. There are several "You tube" videos showing this in action. Specifically, what it does that in my opinion is so useful is that it identifies that the signal any "finder" you are using is screaming about is or is not the right one. I have found so often people struggle with finders but trying pointlessly to get a picture off the wrong satellite; at least with Easy Find you know if that activity is either on target or not. It helps avoid that aimless hunting the skies more in hope than in the use of a structured approach to finding our satellite. I have owned a Satgear 60cm easy find system with the old Comag box for about 8 years now and is a brilliant bit of kit. Takes me about 10 minutes to set up all the hardware and then about 3 minutes to lock onto the satellite using the red & green light system. I have noticed that satgear are offering 10% off to CT members at the moment. The dish will work fine all over France...for the UK channels on the European beam (ie most of the sky pay channels). How to make the two "Gismo's" (complete with photo's) is already contained in my original article "The art of aiming a satellite dish". I think a 80cm will work down as far south as northern Spain for UK channels. Our 65cm dish was able to pick up Sky subscription channels and some others as far down south Valencia, but no UK channels unless I am told you use an Icecrypt box. Icecrypt company no more. Stopped trading last year .A few are still around but no updates available. We had one but replaced it this year.